Experts aren't sure if this wolf is male or female; regardless, its presence is a welcome sign to environmentalists. Visitors this summer to Mt. 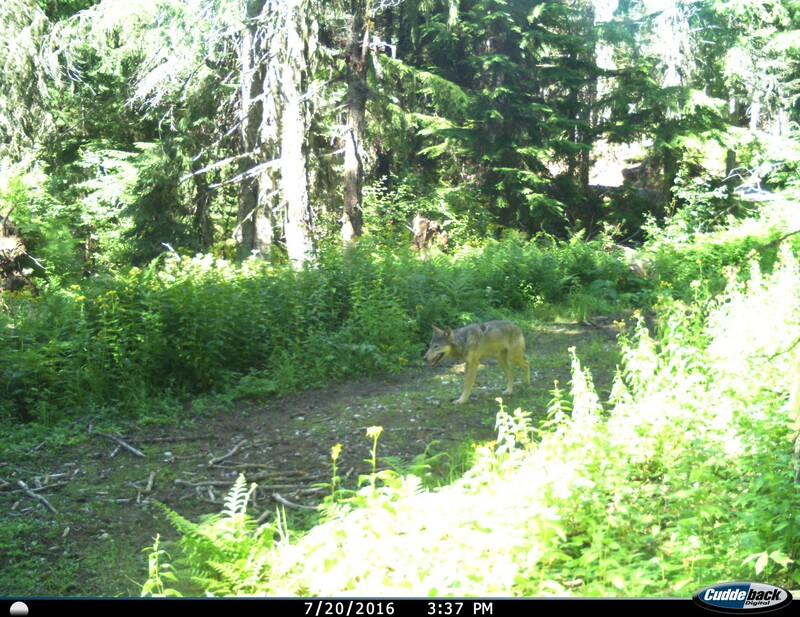 Spokane State Park needn't worry, as the wolf pictured above — captured by motion-censor camera on the southwest side of the mountain in July — is not looking to make them its next meal. This guy, or gal — experts can't confirm its gender based on this picture — is more afraid of us than we are of it. Plus, no one can be sure that this wolf is even still around. Maybe it was just passing through, says Mike Peterson, executive director of Spokane-based The Lands Council, which shared news of the sighting in its latest newsletter. Wolves have wide ranges, and can move dozens of miles in a day, he adds. "Wolves can be wandering through, or they could be establishing a pack, but [this wolf] needs a mate to do that, so we don't know that yet," Peterson says. Regardless, it's a remarkable sign, since there's been few recorded or confirmed sightings of wolves on or around Mt. Spokane in recent years. The animal in the above image is highly likely to be a gray wolf according to a biologist with the Washington Department of Fish and Wildlife. It's seen walking along a road several miles up from a main entry point (closed for road construction until early October) to the state park. This weekend, Peterson and the owner of the camera that captured the image, Hank Siepp, are heading back up the mountain to move some cameras around and hopefully catch more evidence of this either lone or pack-associated wolf. "From the polls that have been done, most people support having wolves back in Washington state, and this is particularly exciting because having one in a state park, it would be more protected compared to those on private land or in national forests," Peterson explains. "State parks have a dual mission to protect wildlife but also offer recreation to the public... so there is a chance people would go up there and observe a wolf which is pretty exciting," he continues. Yet, as the Inlander has previously reported, increased wolf activity in the Inland Northwest region has not been without controversy. While there have been some recent unconfirmed wolf sightings in Spokane County, including in the Turnbull National Wildlife Refuge outside of Cheney, Peterson says most of the region's known wolves are in Idaho or further north of here, in the mountains of the Kettle Range. As long as this wolf (or wolves) spotted on Mt. Spokane stay mostly within the general park boundaries, Peterson expects it should be safer than if living on national forest land. To make sure surrounding residents are aware of its potentially lingering presence, he says the Lands Council is working on public outreach. "There are things to do to lower the risk for chickens, goats or house pets, because no one wants to see those taken away and we want to make sure people do things to be protective of their property," he says. This story has been updated as of Monday, Aug. 8, to reflect corrections since its original posting. This wolf is not the first to have been recorded on Mt. Spokane in more than 70 years, as originally reported.